GFX9.COM share Building a shopping list application from scratch: part 2, you can download now. Tags: ios sdk, mobile development. In the previous lessen, we laid the foundation for the shopping list application. 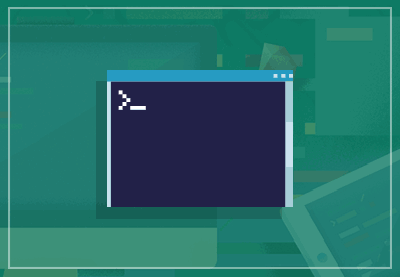 In the first part of this lesson, we'll further refine the application by enabling the user to edit and delete items from the list. In the second part of this lesson, we add the ability to select items from the list to create the shopping list. As I mentioned in the previous article, one of the core features of the shopping list application is managing a list of items. We have done a great job so far, but the user should have the ability to edit and delete items from the list, which will be the focus of the first part of this tutorial. In the second part, we will implement the second core feature of the shopping list application, creating a shopping list by selecting items from the list of items. Let's see how this works in practice. We first need to add an edit button to the navigation bar. In the view controller's viewDidLoad method, create an instance of UIBarButtonItem and assign it to the rightBarButtonItem property of the view controller's navigationItem property. As in the previous lesson, we create a bar button item by calling the initWithBarButtonSystemItem:target:action: initialization method. The first parameter that we pass is UIBarButtonSystemItemEdit. In addition, we pass self as the target and set the action to editItems:. The implementation of the editItems: action is only one line of code as you can see below. Whenever the user taps the edit button, the table view is toggled into or out of edit mode. We do this by using a little trick. We ask the table view whether it currently is in edit mode, which returns a BOOL value, and inverse the returned value (YES becomes NO and vice versa). The method we call on the table view is setEditing:animated:, which is a specialized setter that accepts an animation parameter. If you run the shopping list application in the iOS Simulator and tap the edit button, you should see the table view being toggled into and out of edit mode. When the user taps the edit button, the table view asks its data source which rows are editable by sending the data source a message of tableView:canEditRowAtIndexPath:. When YES is returned for a particular index path, the table view instructs the table view cell of the corresponding row that it needs to toggle into or out of edit mode, depending on the table view's edit mode. In practice, this means that the table view cell shows or hides its editing controls. This concept is best understand by implementing the tableView:canEditRowAtIndexPath: method as shown below. The above implementation of tableView:canEditRowAtIndexPath: enables the user to edit every row in the table view with the exception of the second row. 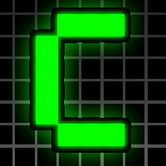 Run the application in the iOS Simulator and give it a try. For the shopping list application, the user needs to be able to edit every row in the table view, which means that tableView:canEditRowAtIndexPath: should always return YES as illustrated below. You may have noticed that nothing happens when you try to delete a row in the table view. The puzzle isn't finished yet. Whenever the user taps the delete button of a row, the table view sends its data source a message of tableView:commitEditingStyle:forRowAtIndexPath:. The second argument of the corresponding method denotes what type of action the user has performed, inserting or deleting a row. 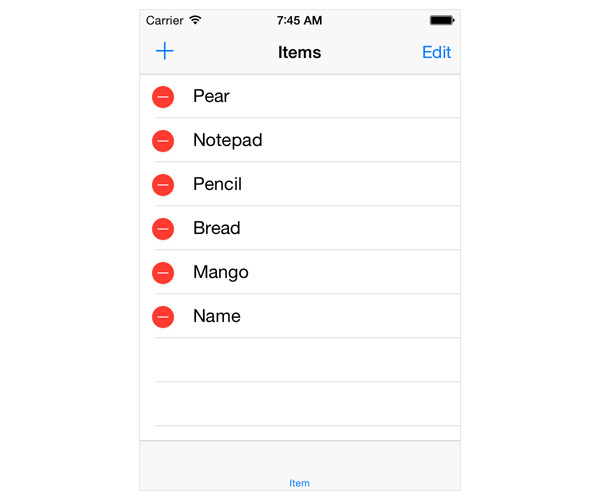 The shopping list application will only provide support for deleting rows from the table view. Let's inspect the implementation of tableView:commitEditingStyle:forRowAtIndexPath:. The method starts by checking whether the editing style is equal to UITableViewCellEditingStyleDelete as we only want to allow the user to delete rows from the table view. 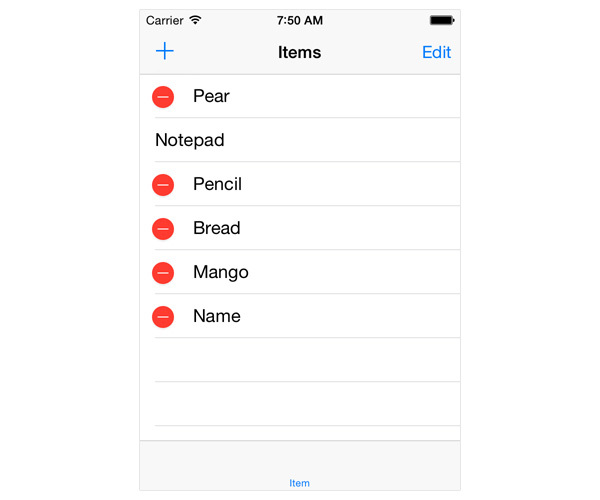 If the editing style is equal to UITableViewCellEditingStyleDelete, then the corresponding item is removed from the items array, the corresponding row is deleted from the table view, and the updated list of items is saved to disk. 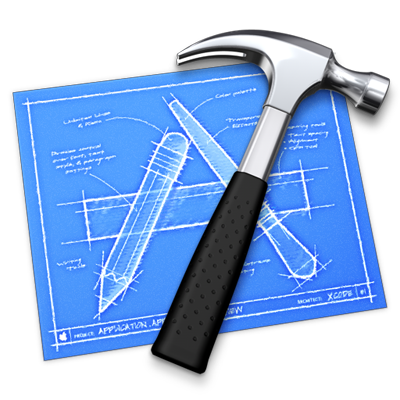 Run the application in the iOS Simulator to test the delete functionality. Don't forget to quit and relaunch the application to verify that items are permanently deleted from the list. We could reuse the TSPAddItemViewController class for editing items, but reusing a view controller class for both adding and editing items can often overcomplicate the implementation so much that I generally end up creating a separate UIViewController subclass for editing items. This will initially result in some overlap in terms of implementation and user interface, but it will give us more flexibility down the road. Create a new UIViewController subclass and name it TSPEditItemViewController. The header files of the TSPAddItemViewController and TSPEditItemViewController classes are very similar. After importing the headers of the UIKit framework, a forward class and protocol declaration is added. The interface of the class is similar to that of the TSPAddItemViewController class. The main difference is the declaration of a property to store the item that's being edited. The header file ends with the declaration of the TSPEditItemViewControllerDelegate protocol. The protocol declaration contains one method that is called when an item is updated. The method accepts the view controller and the updated item as its arguments. Open the main storyboard, drag a UIViewController instance from the Object Library, set its class to TSPEditItemViewController, and create a manual push segue from the list view controller to the edit item view controller, naming it EditItemViewController. Drag two UITextField instances from the Object Library to the view controller's view and position them as shown in the figure below. Select the top text field, open the Attributes Inspector, and enter Name in the Placeholder field. Select the bottom text field and, in the Attributes Inspector, set its placeholder text to Price and set Keyboard to Number Pad. Select the view controller object, open the Connections Inspector, and connect the nameTextField and priceTextField outlets to the corresponding text field in the user interface. In the view controller's viewDidLoad method, create the save button as we did in the TSPAddItemViewController class. The implementation of the save: action is very similar to the one we implemented in the TSPAddItemViewController class. However, there are a few subtle differences that I want to point out. Instead of passing the name and price values to the delegate, we directly update the item and pass the updated item to the view controller's delegate. Because the view controller is a child view controller of a navigation controller, we dismiss the view controller by popping it of the navigation stack. In a few minutes, we'll implement the functionality that allows the user to select items from the list view controller to add them to the shopping list. 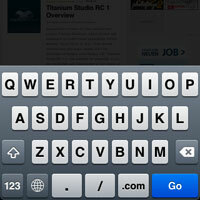 The user will be able to do this by tapping a row in the list view. The question then arises how the user will be able to edit an item if tapping a row is reserved for adding an item to the shopping list? The UIKit framework provides a detail disclosure button for exactly this use case. A detail disclosure button is a small, blue chevron positioned at the right of a table view cell. To add a detail disclosure button to a table view cell, we need to revisit the tableView:cellForRowAtIndexPath: method in the list view controller and amend it as shown below. Every table view cell has a accessoryType property. In the implementation below, we set it to UITableViewCellAccessoryDetailDisclosureButton. As you may have noticed, the engineers at Apple don't like short names. How does the table view notify the delegate when the detail disclosure button is tapped? Unsurprisingly, the UITableViewDelegate protocol defines the tableView:accessoryButtonTappedForRowWithIndexPath: method for this purpose. Take a look at its implementation. We fetch the correct item from the items property and store it in selection, a private property of the list view controller that we'll declare in a moment. We then perform the segue with identifier EditItemViewController. Before we update the implementation of prepareForSegue:sender:, we need to declare a private property for storing the selected item. We also need to import the header file of the TSPEditItemViewController class in TSPListViewController.h and conform the TSPListViewController class to the TSPEditItemViewControllerDelegate protocol. The updated implementation of prepareForSegue:sender: is pretty simple as you can see below. We get a reference to the edit item view controller and set its delegate and item properties. The implementation of the TSPEditItemViewController class is almost complete. In its viewDidLoad method, we populate the text fields with the data of the item property. 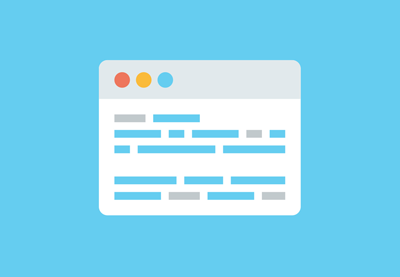 Because the setText: method of a text field only accepts an NSString instance, we need to wrap the float value of the item's price property in a string to display it in priceTextField. Adopting the TSPEditItemViewControllerDelegate protocol is limited to implementing the controller:didUpdateItem: method as shown below. It might surprise you that we don't update the data source of the table view. All we do in the delegate method is reload one row of the table view. The reason that we don't need to update the table view's data source, the items array, is that the updated item was passed by reference to the edit item view controller. In other words, the object that the edit item view controller updated is the same object that is contained in the items array. This is one of the nice benefits of working with objects and pointers. Don't forget to save the list of items to make sure the edits are written to disk. 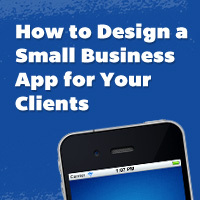 Run the application to test the editing functionality. Before we explore the data source of the shopping list view controller, let's create some scaffolding to work with. 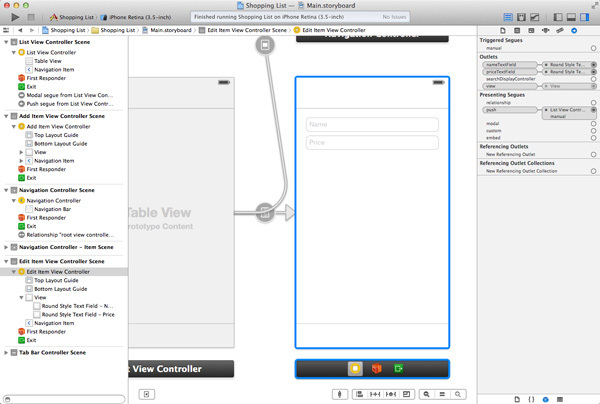 Create a new UITableViewController subclass and name it TSPShoppingListViewController. Since we will be overriding the setter methods of both properties, we have to declare the properties as nonatomic. Don't worry about the exact meaning of this for now. The idea is to load the list of items every time a change is made to the list and then parse the list of items and extract only those items which have their inShoppingList property set to YES. Those items will be added to the shoppingList array. Another option would be to store the shopping list in a separate file, but the downside of this approach would be that we have to keep the items in the list view controller and the items in the shopping list synchronized. This is asking for trouble if you ask me. The setter methods of items and shoppingList will do most of the heavy lifting for us. Take a look at the implementation of setItems:. Whenever the _items instance variable is updated (set with a new value), the buildShoppingList method is called on the view controller. Let's see what the buildShoppingList method looks like. The buildShoppingList method populates the shoppingList array with the items that have their inShoppingList property set to YES. 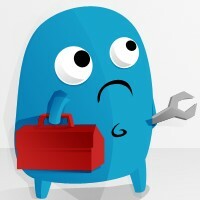 In the buildShoppingList method, we create a mutable array to temporarily store the shopping list items. We then iterate through the list of items and add every item to the mutable array that has a inShoppingList property of YES. Finally, we set the shoppingList property with the contents of the mutable array. Don't forget to import the header file of the TSPItem class at the top. We also override the setShoppingList setter to reload the table view every time the shoppingList array is changed or updated. 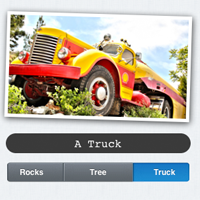 Implementing the methods of the UITableViewDataSource protocol should be child's play by now. Take a look at the implementation of each method below. Don't forget to declare the cell reuse identifier and register the UITableViewCell class like we've done in the TSPListViewController class. As I explained earlier, the key advantage of using the list of items to store and build the shopping list is that the application stores each item in only one place. This makes updating items in the list and in the shopping list much less of a headache. The loadItems method is identical to the one we implemented in the TSPListViewController class. Of course, the pathForItems method is identical as well since we are loading the list of items from the same file as in the TSPListViewController class. When you find yourself duplicating code, you should hear an alarm bell ringing. Duplicating code isn't problematic while you're implementing a new feature. Afterwards, however, you should consider refactoring your code to minimize the amount of duplication in the application's code base. This is a very important concept in software development and is often referred to as DRY, Don't Repeat Yourself. Chris Peters wrote a great article on Tuts+ about DRY programming. Before we put the TSPShoppingListViewController class to use, we need to update the class's initWithCoder: method. In addition to setting the title of the view controller, we also load the list of items, which automatically populates the shoppingList array as we saw earlier. 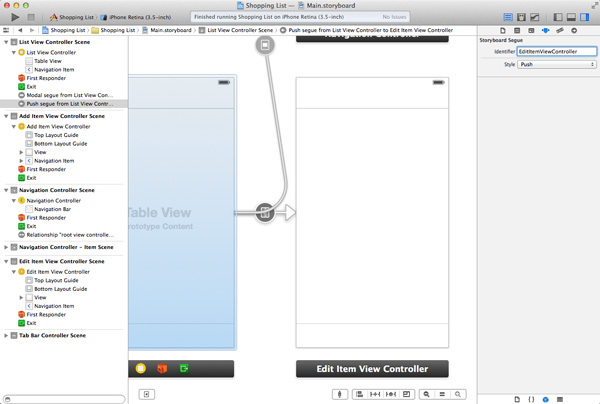 The final step is to initialize the shopping list view controller by updating the main storyboard. This involves adding a UITableViewController instance, settings its class to TSPShoppingListViewController, embedding it in a navigation controller, and creating a relationship segue between the tab bar controller and the navigation controller. Name the segue ShoppingListViewController. Select the table view of the shopping list view controller and set the number of prototype cells to 0. Run the application to see if everything is working properly. Of course, the shopping list is currently empty and we don't have a way to add items to the shopping list. Let's remedy this in the next step. As I wrote earlier, the idea is to add an item to the shopping list when it is tapped in the list view controller. To improve the user experience, if an item is present in the shopping list, we show a green checkmark to the left of the item's name. If an item that is already in the shopping list is tapped, then it is removed from the shopping list and the green checkmark disappears. This means that we need to take a look at the tableView:didSelectRowAtIndexPath: method of the UITableViewDelegate protocol. Before we implement tableView:didSelectRowAtIndexPath:, download the source files of this lesson. In the folder named Resources, find the files named checkmark.png and checkmark@2x.png, and add both of these files to the project. We will need them in a few moments. In the first line of tableView:didSelectRowAtIndexPath:, we send the table view a message of deselectRowAtIndexPath:animated: to deselect the row the user tapped. Whenever a row is tapped, it should only be highlighted for an instant hence this addition. Next, we fetch the corresponding item for the selected row and update the inShoppingList property of the item (YES becomes NO and vice versa). Based on the value of the item's setInShoppingList property, we either show or hide the green checkmark. We show the checkmark by setting the image property of the table view cell's imageView property. 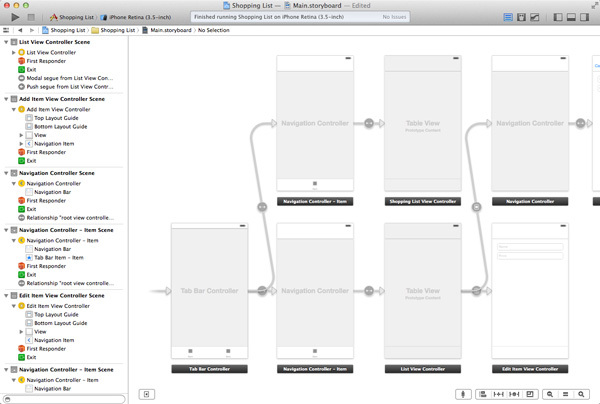 Every UITableViewCell instance contains an image view on its left (an instance of the UIImageView class). By setting the image view's image property to nil, the image view is blank, showing no image. The implementation of tableView:didSelectRowAtIndexPath: ends by saving the list of items to disk to make sure that the changes are permanent. How does the shopping list know when an item in the list view controller is tapped by the user? The shopping list view controller will not update its table view automatically if a change was made to the list of items in the list view controller. In addition, we don't want the list view controller and the shopping list view controller to communicate directly to one another to prevent any form of tight coupling. One solution to this problem is the use of notifications. Whenever the list view controller makes a change to the list of items, it posts a notification with a specific name to the notification center, an object that manages notifications. Objects that are interested in certain notifications can add themselves as observers of those notifications, which means that they can respond when those notifications are posted to the notification center. Before we implement the three steps I just described, it's a good idea to take a closer look at the NSNotificationCenter class. If the last argument is set to nil, the observer receives every notifications with the specified name. Revisit the initWithCoder: method of the TSPShoppingListViewController class and add the view controller instance as an observer to receive notifications with a name of TSPShoppingListDidChangeNotification. The action triggered when the view controller receives a notification with that name is updateShoppingList:. We set the object to nil as it doesn't really matter which object sent the notification. Before we implement updateShoppingList:, we need to amend the viewDidLoad method of the shopping list view controller. In viewDidLoad, we load the items from disk. The method that is triggered when the observer receives a notification has a specific format as you can see below. It accepts one argument, that is, the notification object which is of type NSNotification. The notification object keeps a reference to the object that posted the notification and it can also contain a dictionary with additional information. The implementation of the updateShoppingList: method is quite simple, that is, the loadItems method is called on the view controller, which means that the list of items is loaded from disk. The rest happens automatically thanks to the custom setter methods that we implemented earlier. The third piece of the puzzle is posting a notification whenever the list of items is changed by the list view controller. We can do this in the saveItems method of the TSPListViewController class. We first ask for a reference to the default notification center by calling defaultCenter on the NSNotificationCenter class. Next, we call postNotificationName:object: on the default notification center and pass the name of the notification, TSPShoppingListDidChangeNotification, and the object posting the notification. Before you build the project, make sure to amend the tableView:cellForRowAtIndexPath: as shown below to display a green checkmark for items that are already present in the shopping list. Run the shopping list application to give it a spin. Have you noticed that edits to an item are automatically reflected in the shopping list? Great. Where is the button to publish the shopping list application to the App Store? We are not quite done yet. Even though we have laid the foundation of the shopping list application, it isn't ready for publication. There are also a few things to consider. 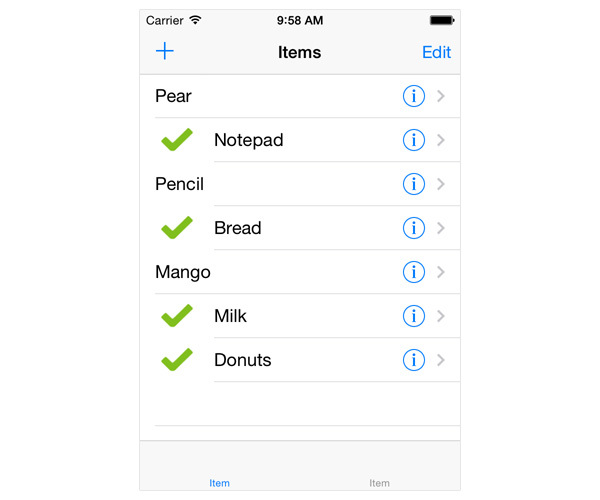 The shopping list application is a modest implementation of a shopping list. If the application were to contain hundreds or thousands of items then it would be pertinent to add search capabilities as well as sections to sort the items alphabetically (as we did earlier in this series). It is important to realize that the list of items is written to disk in its entirety every time an item is updated. This is no problem when the list is small, but it will be if the list grows over time to hundreds or thousands of items. Also, users may want to save more than one shopping list. How would you deal with that? One option would be to store each shopping list in a separate file, but how would you deal with changes made to items? Are you going to update every shopping list that contains the item? When you start dealing with relationships, it is better to choose for an SQLite data store. Core Data is an great companion if you choose to go down that road. It is a powerful framework and sports a lot of features that make a lot of the code in our shopping list application obsolete. It is true that Core Data brings a bit more overhead with it so it is key to first consider if Core Data is suitable for your application, in other words, if it is worth the overhead. There is also a lot of potential for additional features. The price property of the items remains unused in the current implementation of the shopping list application. Also, it would be nice if the user could check off an item from the shopping list by tapping the item. As you can see, the current implementation of the shopping list application is only a modest start. Even though the shopping list application isn't quite ready for the App Store yet, you can't deny that it works as we planned and it has shown you a lot of new aspects of Cocoa development, such as notifications and implementing a custom delegate protocol. 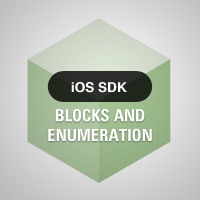 You now know what to expect from the iOS SDK and what iOS development is like. It is up to you to decide if you want to continue your journey and become a skilled iOS developer. If you do choose to continue with iOS development, then I will provide you with some great resources in next and final installment of this series.